Douglas 224 Winter Knights flowing over into Knysna Fire Disaster! Round Table Douglas 224 had their annual Winter Knights on the 19th May 2017. This year, due to our busy schedule of planting and harvesting maize, we unfortunately picked the wrong date for our Winter Knights. 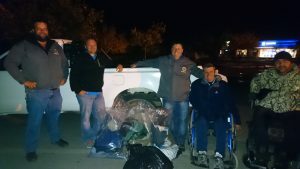 We once again, parked ourselves in the Douglas Spar parking area, lit the fires and started with our usual routine of fellowship, while doing good for our community, but despite our efforts of advertising on social media (Wattsap and Facebook) as well as putting up posters and advertising on OFM Community calendar, our annual Winter Knights was not supported by the locals as well as previous years. Never the less, we managed to receive 10 black bags of clothing and R300 in cash donations. Great fun was had by all that attended and braved the cold. All this being said, less than a month later, disaster struck in Knysna with the runaway fires. 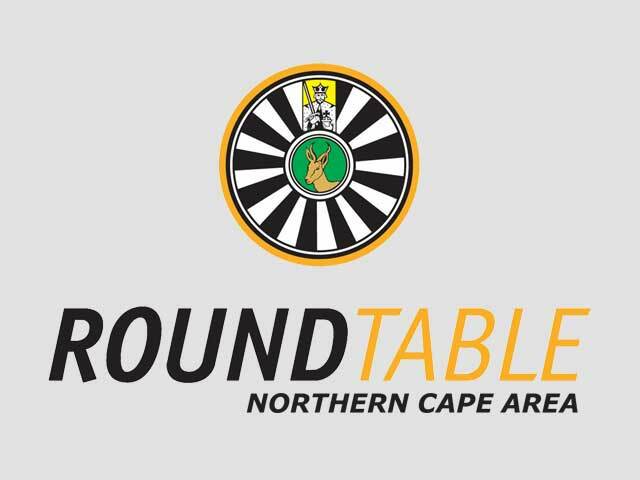 We as Round Table Douglas 224 decided to act and assist the Knysna Fire victims and offered our service to transport and deliver any donations received. 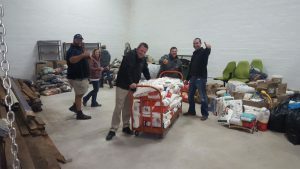 Our plea went viral and we were swamped with cash donations, non perishable foods, blankets, clothing as well as pallets of potatoes that farmers donated towards this worthy cause. Trollies were placed in our local Supermarkets and the Douglas community opened their hearts and wallets and filled these trollies a number of times! 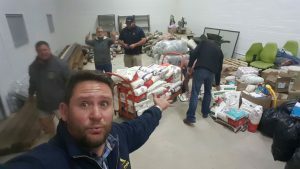 Soon we were faced with the daunting task of sorting all clothing and foodstuffs, but again the Community of Douglas pulled together to help. Marzaan and Johnny Brits and Nico Heyneke (Helpende Hand- another charity organisation in Douglas) got a task team together, including High School students to assist with packing and sorting. Soon we had a system running that worked like a well oiled machine! On Wednesday, 14 June 2017, 5 Douglas 224 Tabers, started loading a 10 ton truck with all donations to head down to Knysna. 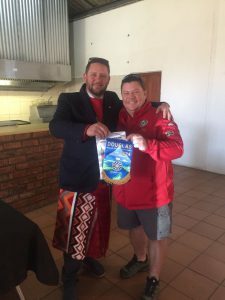 We had a late get away, as we were waiting for a consignment of 100 blankets to be delivered to us, especially couriered from Johannesburg that morning. 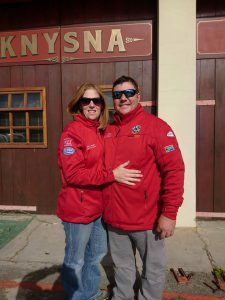 We finally arrived in Oudtshoorn, as we could only get transport sponsored to there and no further. 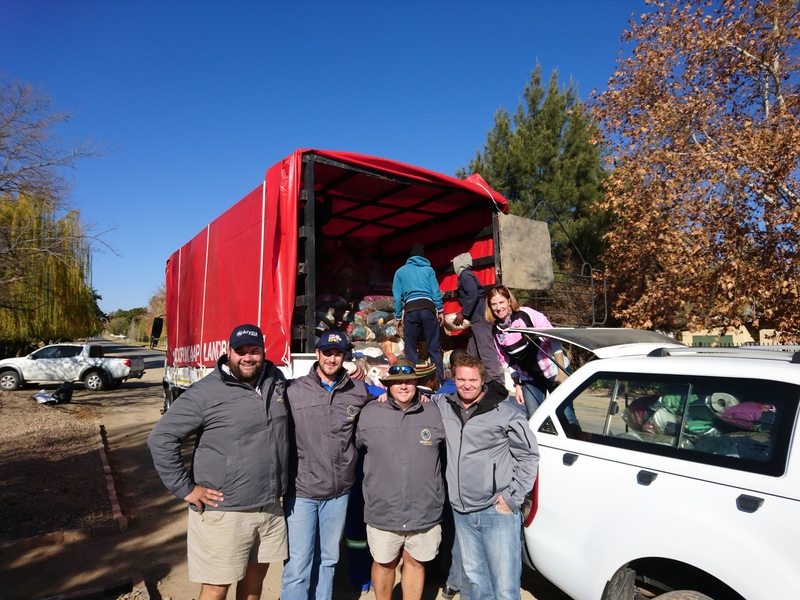 We were met by Zelda du Preez (Werner Tome- Oudtshoorn 33 and South Cape Area Chairman’s fiancé) Soon the reinforcements arrived from Oudtshoorn 33 Tablers to help unpack the load. After a tiring 3 hours of unpacking, Gernes Claassen, treated us to a warm B&B, where we had a much needed and much deserved rest. 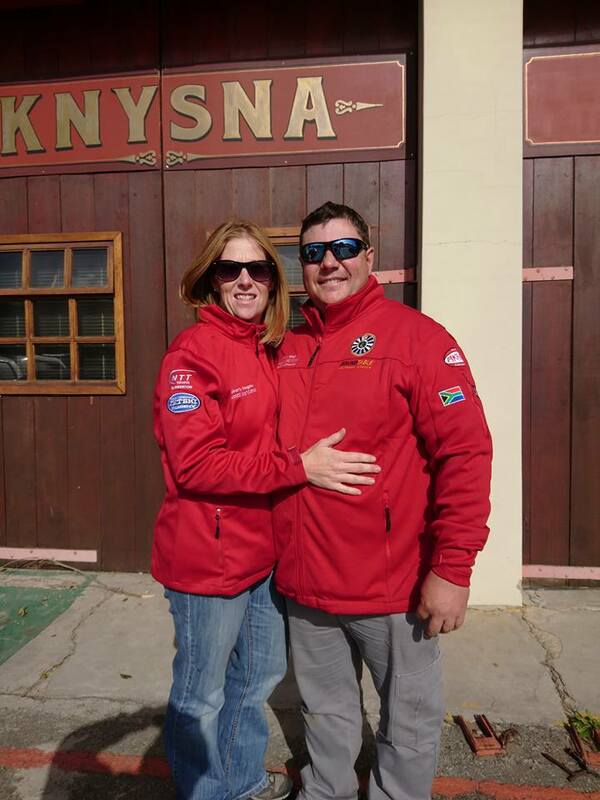 The Thursday morning, Michael Jacobs (Chairman Douglas 224), Andreaco le Grange (Vice Chairman Douglas 224), Hilton Megaw and wife, Johanita Megaw headed further on to Knysna. We never knew what an emotional experience this would turn out to be. On our way there, we assisted a lady that lost control of her vehicle on the Outaniqua pass and crashed into the side of the mountain. We stayed on the scene until medics had arrived and other officials. Thankfully no one was seriously injured; just a few bumps and bruises sustained, but our service to the community had already started there on the pass! We eventually got going and drove through to Knysna. Driving through the devastation and seeing and smelling fires still being combated by Helicopters, really hit home. Reality kicked in when we saw homes burned to the ground and seeing the remains of pots and pans still inside burned down homes. A few days ago, these people had a home, warm bed, car, food to eat and now- nothing!! Nothing could keep the tears from rolling down our faces. We arrived with Goodie bags, made for the Firefighters, in the form of 2 litres of water, Rehydrate, Eyegene and a Bible. The most essential firefighting equipment needed. 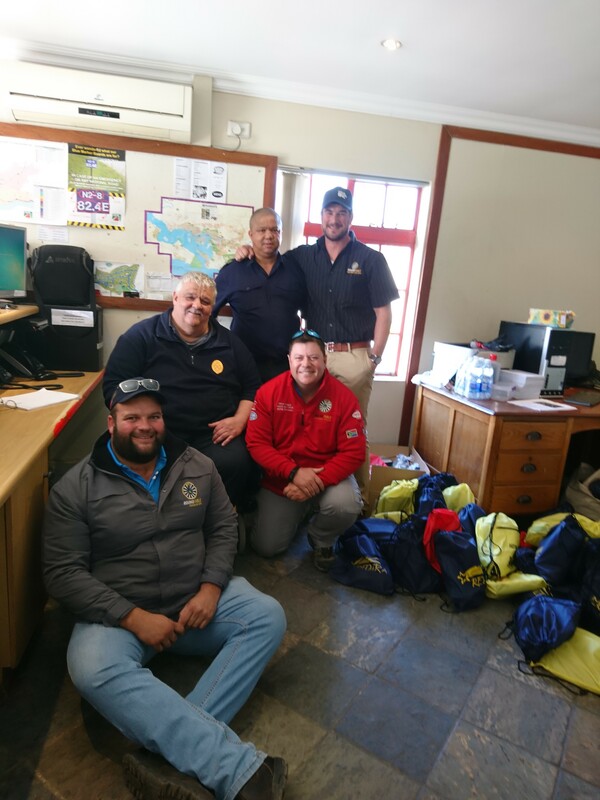 The goodie bags were delivered to the Knysna Fire Department and distributed to local firemen and women. Seeing the gratitude on the Firefighters faces, while receiving their Goody Bags, made every minute, hour, day, sweat and tear, worth it. We left Knysna with saddened hearts, but with hope and faith that it will be restored to it’s original beautiful place once again. Thank you to Oudsthoorn 33 (Gernes, Werner, Zelda, Lourie and Morne) for your assistance and taking care of the distribution of donations. We, the Douglas community, really do appreciate it. It is an honour to be associated with such amazing, caring people such as yourself! 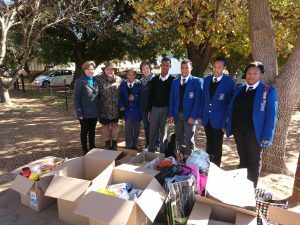 Then a huge thank you has to go out to the Northern Cape Communities, for opening your hearts towards this worthy cause. South Cape area assisted us in the 1988 floods and it was our turn to lend a hand!